Fears of global warming, a double dip recession, and rising gas prices have many North Americans running away from the gas pumps. We’re seeing a rising number of people parking (or selling) their cars and buying motorcycles as a more earth-friendly, convenient, affordable and fun method of transportation. Before you rush to trade in your Suzuki SUV for a Suzuki SV, let’s look at whether or not motorcycles are more environmentally friendly then cars. This week, TV show MythBusters looked at the Motorcycles vs. Cars green friendly debate and their findings were consistent with those of the past few years. The tests were 75% highway driving, and 25% in the city, and consisted of a sample of vehicles from the 1980s through to the 2000s. Fuel Efficiency: Motorcycles were found 28% more fuel efficient than cars. Not surprising as the average sedan weighs over 2,700 lbs, and an average motorcycle weighs about five times less. Carbon Dioxide: Motorcycles produced 30% less greenhouse carbon dioxide, a toxic greenhouse gas in the earth’s atmosphere. Other Emissions: Unfortunately, despite leaps and bounds in cleaner emissions in motorcycles over the last three decades, motorcycle emissions were much worse then cars. Motorcycles produced over four times the hydrocarbons, over thirty times the nitrogen oxides, and eighty times more carbon monoxide. MythBusters did a good job gathering data on both types of vehicles but they didn’t investigate the effects of having fewer cars and more motorcycles. When it comes to my work commute, it takes me far less time on two-wheels then it would on four. My vehicle is smaller, more nimble, better handling, and though it has 1/10th of the horsepower of many cars on the road, it has a much better power to weight ratio. I simply fit places and can get through traffic more effectively than cars can. When I arrive at work I park right outside of the front door. I never have to idle or ride around the block in hopes of finding a parking spot. 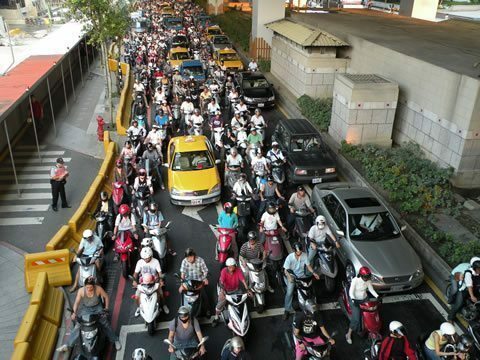 One on one a motorcycle’s emissions may be worse than a car’s, but with increasing population densities in cities across North America we have to wonder what’s worse for our roads: every commuter stuck in rush hour traffic in a car, or every commuter zipping by on a motorcycle. 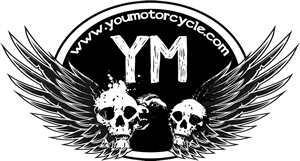 Please share, leave a comment, or visit YouMotorcycle.com’s home page for the latest stories! Well, that’s pretty surprising. I do like how you countered with the rebuttal of less time spent in traffic, idling, and looking for a parking spot. I wonder how much that evens the odds? I think that we have too many people.